Fukuoka is our favorite urban playground but on weekends we love to get out of town, and Oita Prefecture is one of our top weekend getaway destinations. 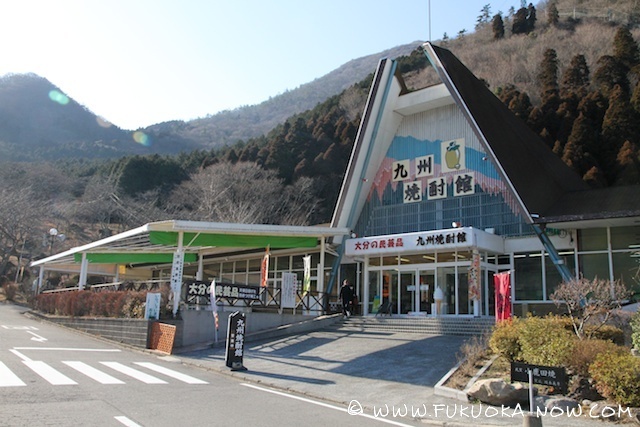 While day trips from Fukuoka are possible, it’s better to spend a night. With so many tempting attractions in Oita, we recommend planning well and limiting yourself to a realistic number of spots located in one general area. This month we made a start on exploring Oita for a series of new reports. We’ll visit other places in different areas in the upcoming months, so stay tuned! We hope you find this first report useful and get some inspiration for your next weekend getaway. Feel free to share your personal tips and information about Oita in the comment section below. We might use that information in our next trip and report! “Let’s leave really early to avoid heavy traffic.” That’s how I hoped to convince my partner to wake up early on the morning of our trip (the real reason being that I was simply eager to get the weekend started!) My persuasion tactics prevailed and we managed to arrive at the Dazaifu interchange by a respectable 8am. From there we drove for 146 kilometers (about two hours) before arriving in Usa. Not the U.S.A., but Oita’s Usa – home to the very famous Usa Shrine, the main shrine of all 40,000 Hachiman Shrines scattered around Japan. This was an ideal place to stretch our legs after the long highway drive and to purify our souls before continuing the journey. 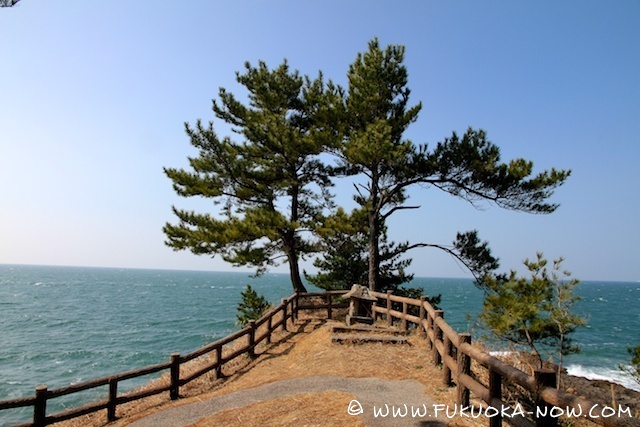 Usa Shrine is considered by many to be one of the strongest spiritual power spots in Kyushu. Its spacious grounds include a lush wooded area, creating a solemn atmosphere. The main shrine is nothing less than a national treasure with a distinctive torii gate as well as a sacred tree which is estimated to be 800 years old. 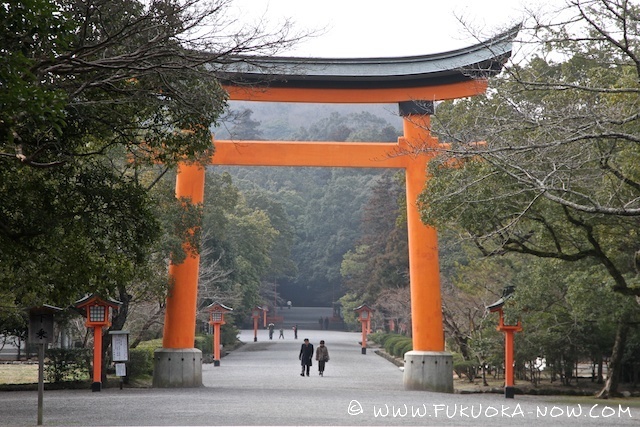 Usa Torii Gate: This torii gate is unique to Usa Shrine. It has no center tablet board (or gakuzuka), and the architraves (or daiwa) are placed on top of the pillar. We felt a special power by pressing our hands on a huge camphor tree, and worshiped in the Usa Shrine manner of “bowing twice, clapping four times, and bowing once”. There is no particular rule regarding the amount of an offering but we each put a five-yen coin in the box for worship because “being linked by a good fate” and “five yen” have the same phonetic sound in Japanese. “Go-en” – it’s a play on words. We took a lots of photos and sipped sweet, hot sake while chatting with the friendly female proprietors who run shops along the approach to the shrine. Now, spiritually purified and energized, it was off to our next stop “Showa Town”. Usa Shrine is the head office of the 40,000 (approx.) 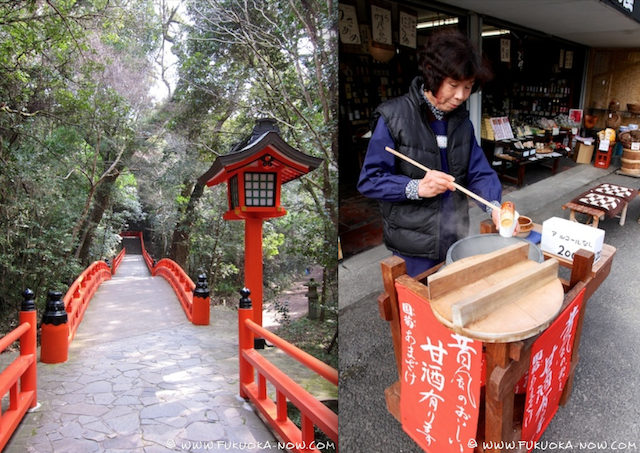 Hachiman Shrines that exist nationwide. The shrine is also believed to be the birthplace of syncretism between the god of ancient Japan and the tantric faith of Buddhism. 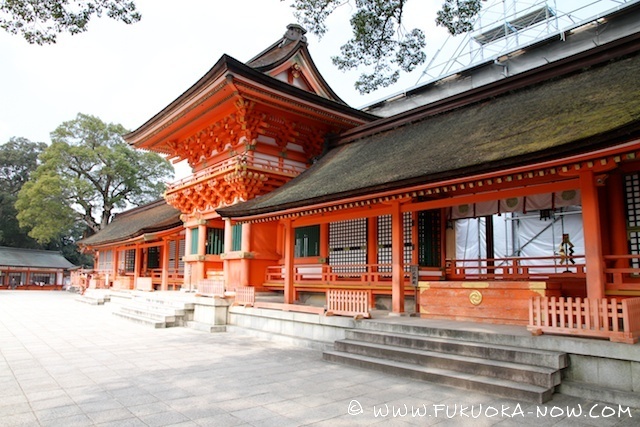 Emperor Ōjin who was known as the tutelary god of warriors is said to be enshrined here. The faith that sees God in nature, and the faith that seeks the life of human beings through the teaching of Buddha show a harmonious relationship between man and nature, living side by side in a symbiotic relationship. The shrine was also home to the lord of Tashibu Manor, one of the biggest manors in Kyushu, and is famous for the vast rural landscape of rice terraces which have been protected for over 1,000 years. Fast forward to present day Japan, where Usa Shrine attracts some notable visitors. Locals say that members of the popular dance and vocal unit EXILE visited the shrine to pray. Not long after their visit, they enjoyed the success of a million-selling record “EXILE LOVE”. 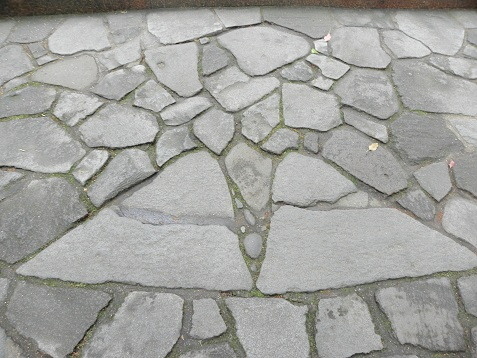 You’ll find some curious, triangular stones called Meotoishi in the pavement of the stairs along the way to the shrine’s main building (or honden). It is said that happiness for the future can be attained by stomping your feet on the stones: a couple stamp should stomp together, and a single person should stomp the stones with both feet. Give it a try! Next stop – Showa Town! This spot is a very unique and clever example of what other small, old towns around Japan should consider, namely, converting their weaknesses into strengths. 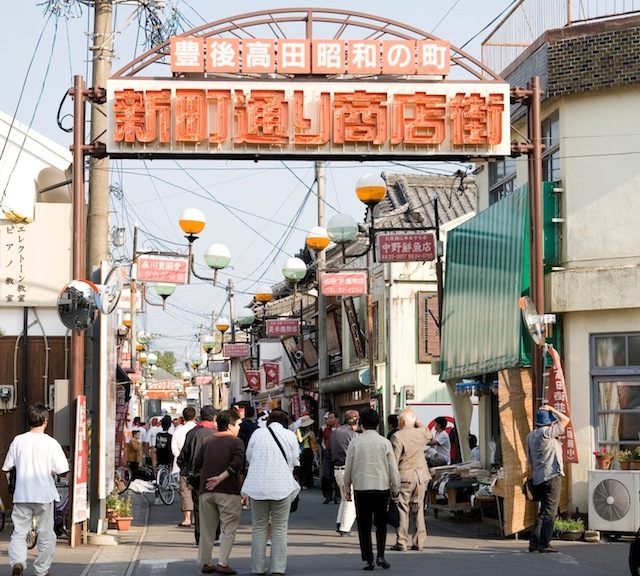 Showa Town, until recently, was just another rusty and dusty, underpopulated town with many shuttered shops. Now, cleverly produced as a townscape of the fifties and sixties (Showa Period), it has become somewhat of an outdoor living museum. Strolling down the streets, we found diners that haven’t raised prices since the Showa period, a restaurant that offers school lunches from the day, and shops displaying and selling all manner of nostalgic goods. 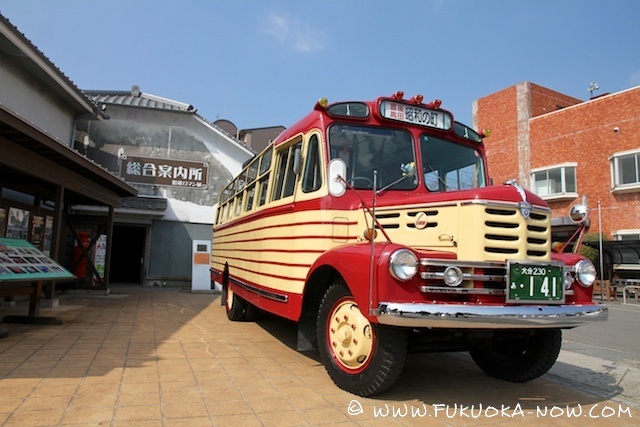 The Showa Bus: This bus was actually used here in the Showa period. Its compact body and striking colors still look cool today. There’s a museum fashioned from the Takada Agricultural Warehouse, which was built around 1935 by one of the richest men in Oita Prefecture. We enjoyed checking out displays both inside and outdoors, including a variety of vehicles from the day. Inside there’s a huge collection of pop culture artifacts, such as figures, posters, toys, magazines, old appliances and more. 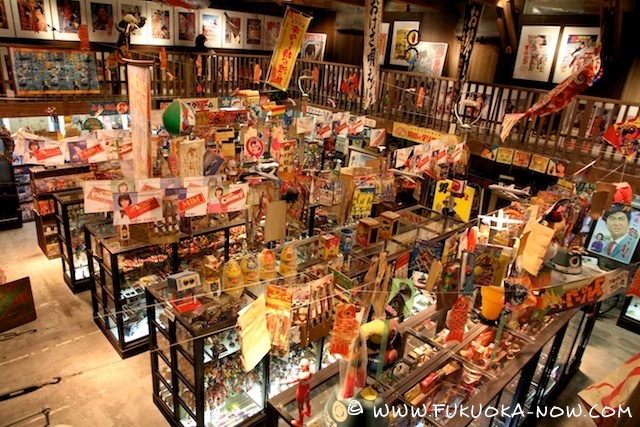 The collection is truly impressive and will give you an entertaining insight into one of Japan’s most fondly remembered eras. Kaneoka Meat Shop: This shop is known for its tasty croquettes. 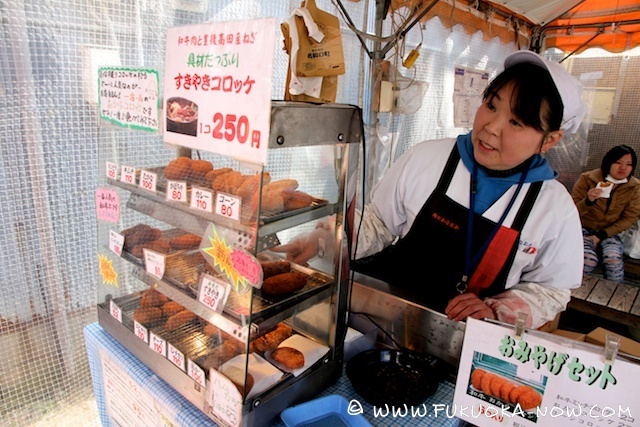 We snacked on a few crispy fried croquettes as we strolled up and down the nostalgic streets. Tip! Oita-style Lunch: For lunch, we tried some Oita culinary classics, including Dango-jiru (dumpling soup) and Toriten (tempura chicken). 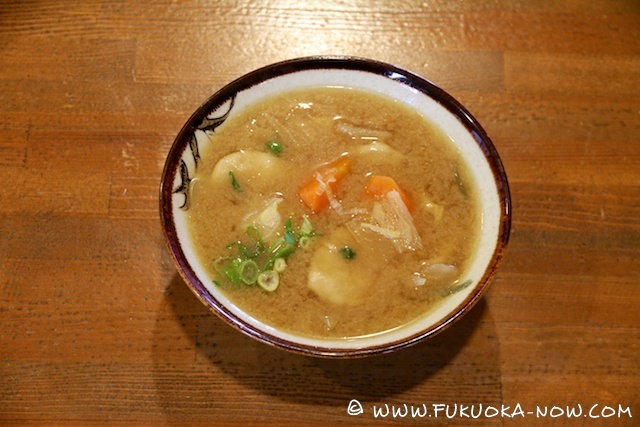 The dumplings, made from flour, are cooked with vegetables in miso soup. The deep-fried, battered chicken is served with mustard and Kabosu-ponzu, a juicy-green-citrus-fruit-based soy dipping sauce. Yum! After a satisfying lunch, we hopped back into our car in search of some beautiful scenery (and what we hoped would be our first peak of the ocean!) 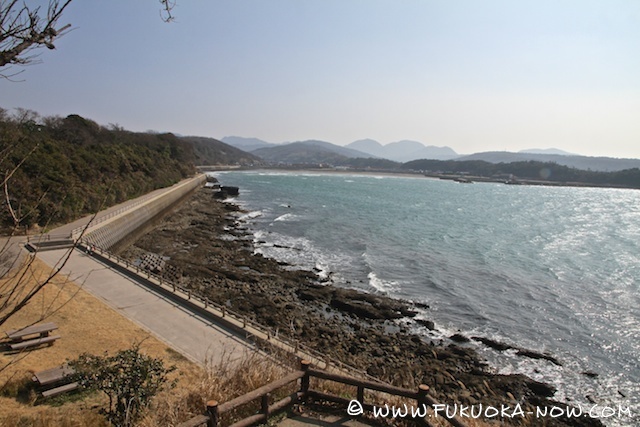 After following a rolling coastline toward the tip of the Kunisaki Peninsula, we turned off onto a small peninsula with several beaches and ocean surrounding almost the entire area. 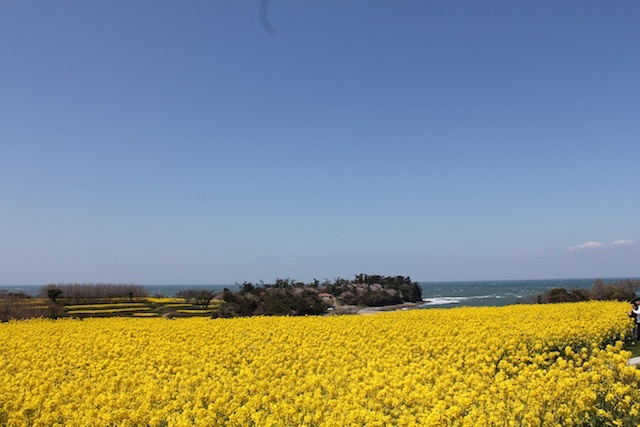 This is Nagasakibana Resort Campsite, which will be covered with bright yellow rapeseed flowers by the time this report is published (mid-March to mid-April) and 800,000 sunflowers in summer (mid-July to mid-September) as well as cosmos flowers. We got there a bit too early in the year to see the rapeseed spectacle, but we agreed that it must be a lovely spot to to see seasonal flowers, green fields, blue sky, waves and tall trees. 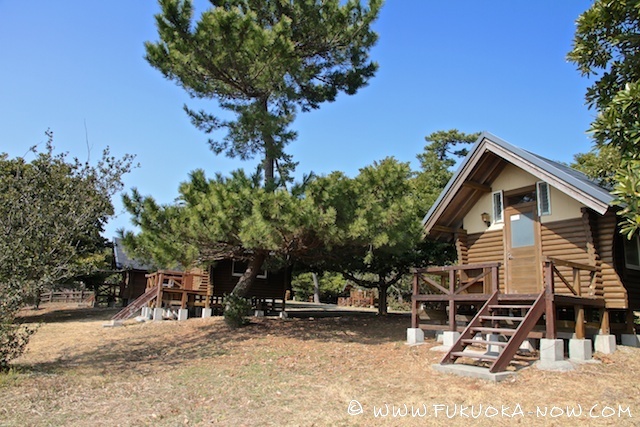 Nagasakibana is a very relaxing and refreshing setting, with excellent camping facilities available too. Some of the area’s newest attractions are artworks installed as part of the Kunisaki Art Project. Korean modern artist Choi Jeong Hwa’s “iroiro” is a pyramid-shaped configuration of flowers planted in the terraced field, and Yoko Ono’s “Invisible Benches” includes several conceptual art pieces. There’s also a laurel at Nagasakibana which is named as Yoko Ono’s “Tree of Dreams”. If you make a wish on the tree, it’s said that the wish will be sent to the “Imagine Peace Tower” in Iceland. 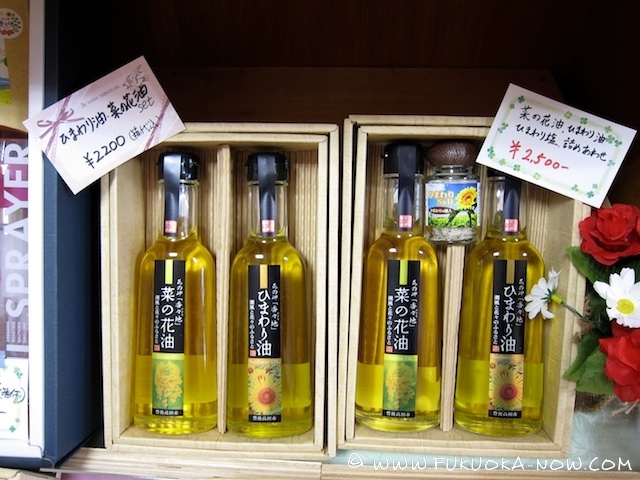 Locally produced oils: Flower seeds grown in Nagasakibana are made into rapeseed oil and sunflower oil by a traditional method of squeezing. These oils are very fragrant and make an ideal souvenir. Bungalows are available to rent from ¥5,000/night. The campsite and beach areas are very popular in summer during swimming season. The easy-to access swimming beaches are located adjacent to the bungalows – close enough that you can walk to them in a swimsuit! Fishing from the seashore rocks is popular too. Everybody knows that no trip to Oita is complete without a dip in an onsen (hot spring). Even better is spending the night at a ryokan (Japanese inn) with onsen. 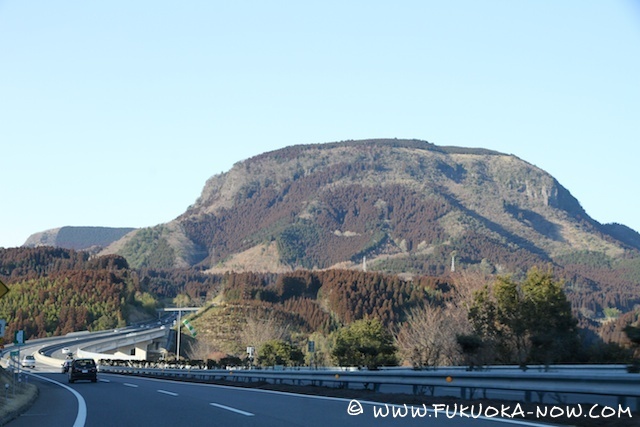 So we steered our car in the direction of Beppu, possibly Japan’s most famous and largest onsen areas – in terms of both the number of springs and the volume of hot mineral water. On the way to Beppu, we noticed signs for a winery in Ajimu, an area known for grape-growing, and decided to make a quick detour. Unfortunately we arrived just as the winery was closing for the day, missing our chance to take a tour and sip samples. As a consolation, the souvenir shop was open until 17:00, and we managed to do some tasting there. We’ll take the tour next time. Located in a hilly area, the winery facility offers tours to show the process of local winemaking: from harvesting locally grown grapes all the way to the finished wine products. The tour includes visiting the vineyard, brewing and storage facilities, and tasting. There are also restaurants and shops within the winery. Tip! If you’re driving and cannot drink alcohol, don’t despair! 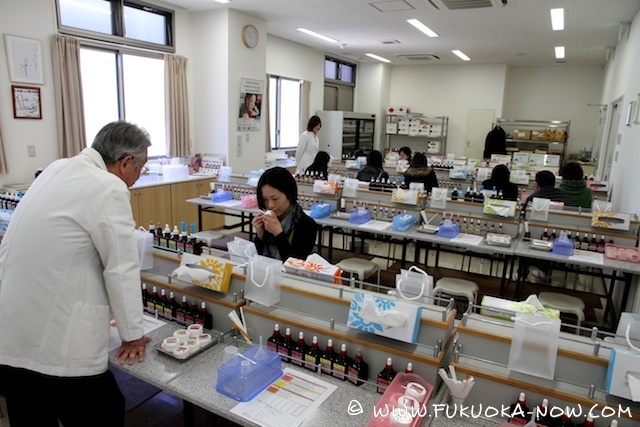 They also produce and sell a highly recommended non-alcoholic herb water, extracted from herbs grown in Ajimu. Try this water after a dip in a hot spring. The photo shows rosehip and lemongrass. 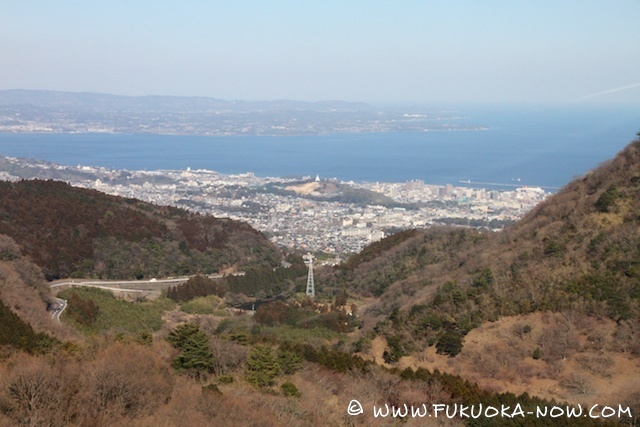 The drive from Ajimu to Beppu offered lots of great scenery in the mountains, ending with the view of Beppu and the Pacific Ocean as we neared our destination: Myoban Onsen (just outside of Beppu). 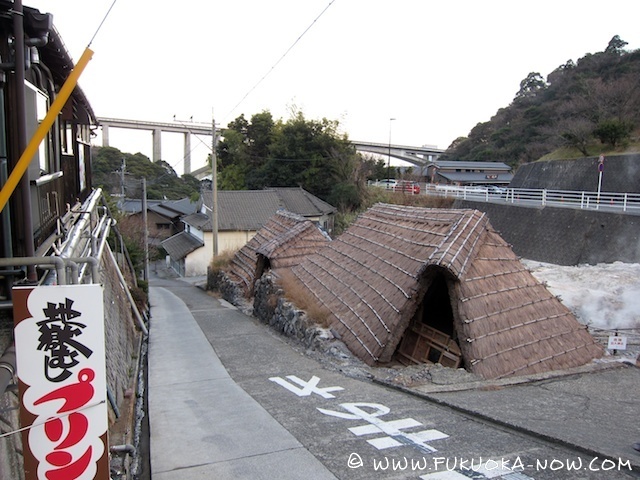 The small town of Myoban Onsen straddles a busy road and is easily recognizable by the thatched straw “yunohana huts” in which alum (mineral salts) are collected. 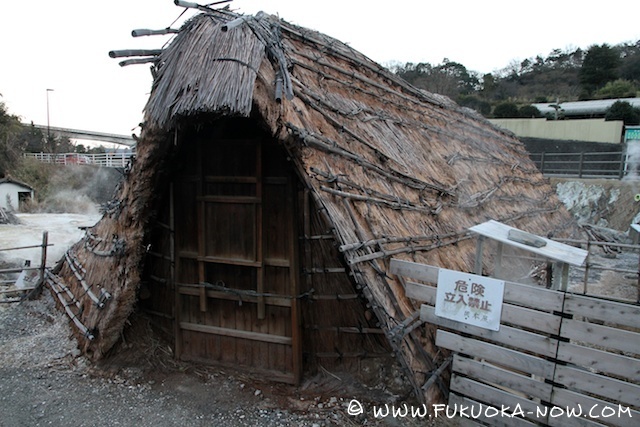 The yunohana huts are about head height and usually have hot spring steam flowing out of their roofs. Peek inside and you can see the deposits of alum, which are collected and used in various products, such as bath salts. We chose Myoban for its highly regarded milky color waters that contains lots of sulfur, boasting mainly therapeutic benefits. As for the choice of inns, we chose “Okamotoya” (see data below) after we heard they are credited with being the pioneers of “pudding steamed in hell” – referring to the process of making their delicious sweet pudding with steam from the hot springs. Of course, you can enjoy the puddings without staying at the inn – they’re also available for purchase at a shop near the road. Just ask around. 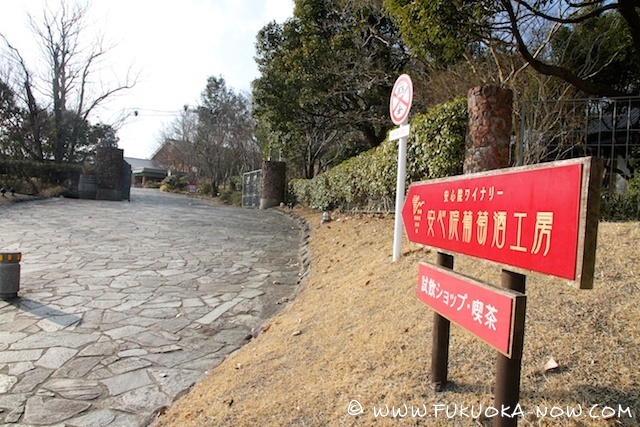 The inn’s main baths are also open to the public for around ¥800, depending on the inn’s occupancy (call ahead to check). 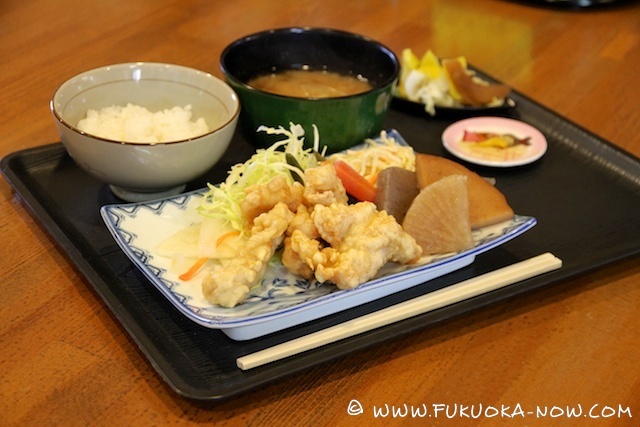 But, as the locals know, it’s the ryokan meals served that really make staying overnight a big treat. Most courses of the meal were made with local and seasonal ingredients, making a nice match to the power we felt at Usa Shrine and the detox process from our dip in the hot spring. The beautifully presented dishes were a feast for the eyes too! After dinner, we indulged in another dip in the onsen, and in the morning we tried out the large outdoor bath with a view of the forested mountains and blue skies. Followed by a superb breakfast we were ready to (rather reluctantly) leave the onsen for the second and final day of our tour. 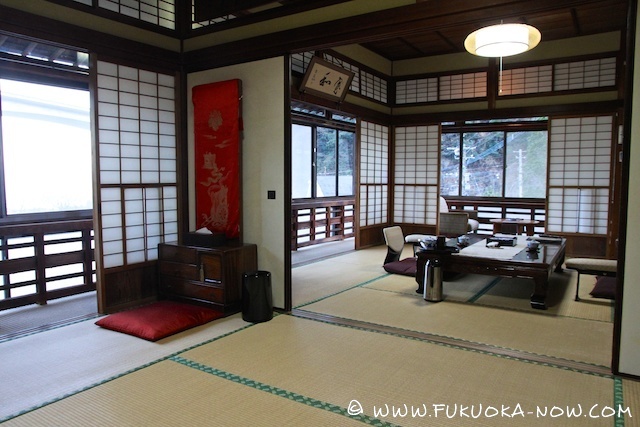 Accommodation from ¥13,800 per night per adult including two meals. (Check-in: From 15:00, Checkout: 10:00.) 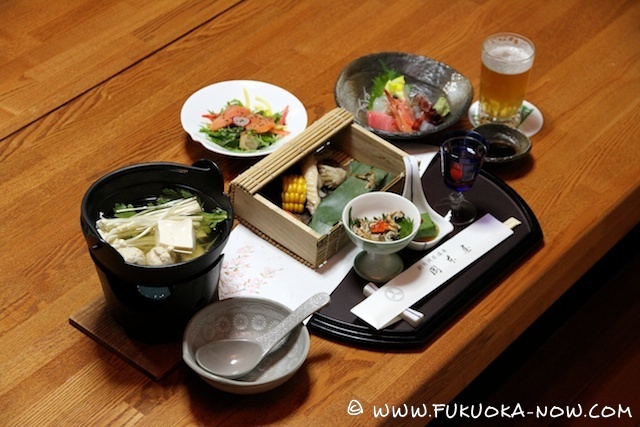 The dishes are prepared using plenty of local Oita ingredients, and seasonal vegetables and meat are cooked with the hot spring steam. This cooking style is called jigokumushi (which literally means steamed like hell at a high temperature); therefore umami (taste of food) is sealed inside. 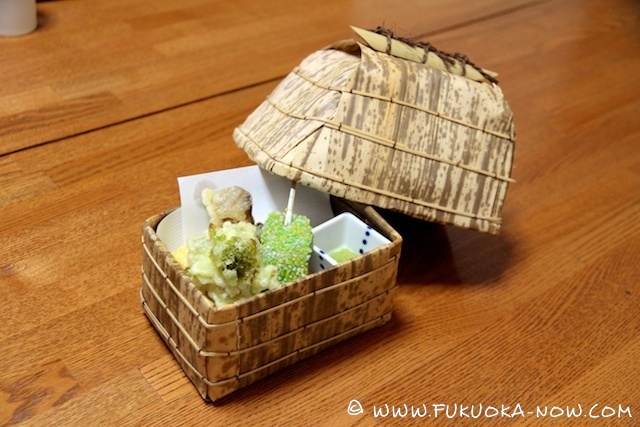 Tempura is served in a dish that mimics the shape of a yunohana hut. 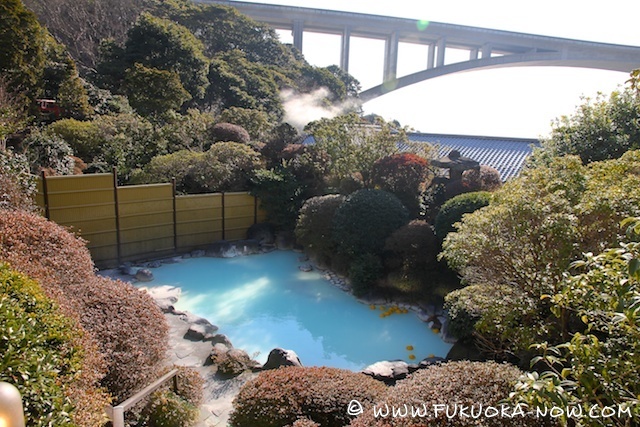 There are several hundreds of hot springs around Beppu City. 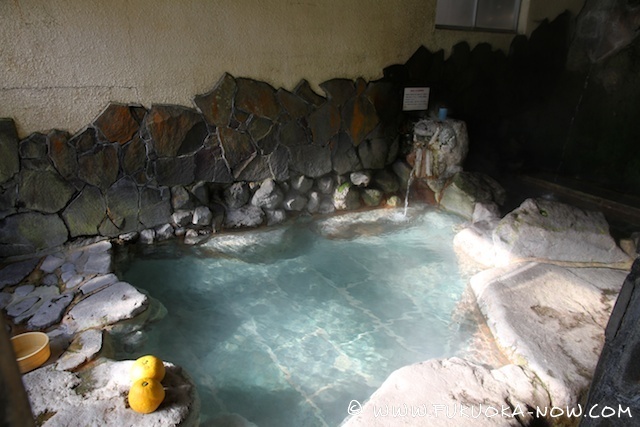 The hot spring villages are divided into eight areas, collectively named the Beppu Eight Springs (Beppu Onsen, Hamawaki Onsen, Kankaiji Onsen, Horita Onsen, Myoban Onsen, Kannawa Onsen, Shibaseki Onsen, and Kamegawa Onsen). 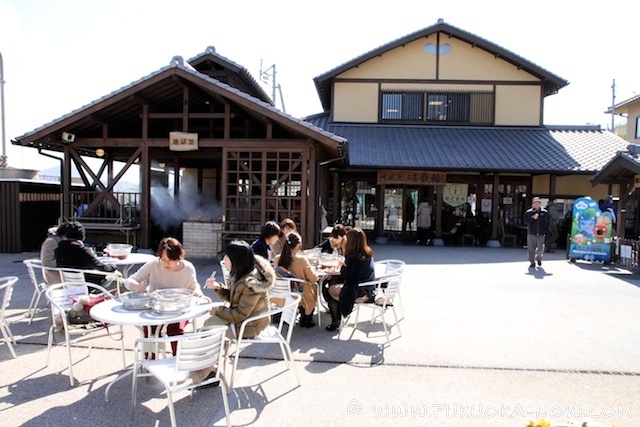 Myoban Onsen is located in a geothermal field at the highest altitude in Beppu. Alum has been collected there since the Edo period. The landscape – with its yunohana huts and hot spring steam hanging over them – has been designated as a significant intangible folk cultural asset. 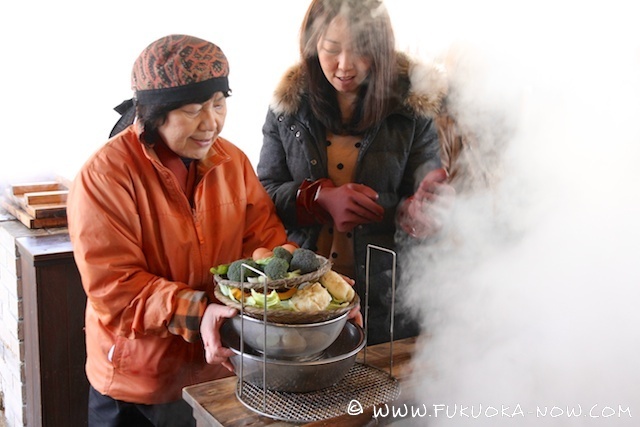 The “pudding steamed in hell”, made with steam that contains a lot of sulfur, is also popular. 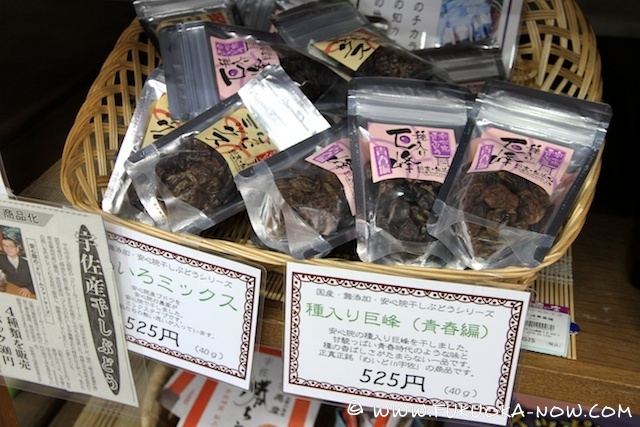 These puddings, along with boiled eggs, and the “yunohana” natural bath salts, made by crystallizing hot spring water, can be purchased at the shop. “Pudding Steamed in Hell” and boiled eggs are some of the souvenirs available for purchase. • Closed: 3rd Wednesday of Dec. 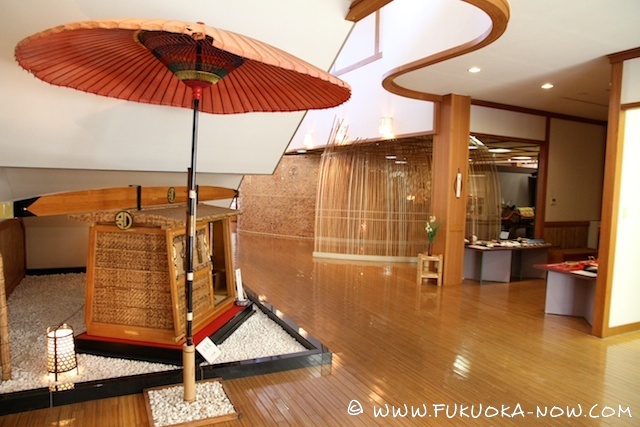 The name “Takegawara” originates from the time when the bathhouse was constructed in 1879. 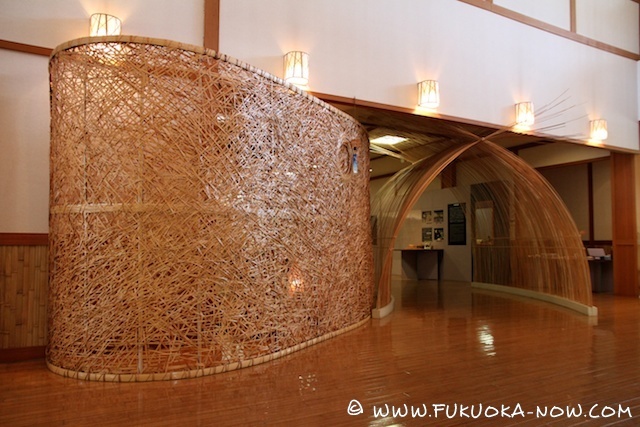 It features bamboo roofing, and the current building is a wooden structure, which was renovated in 1938. The roof is a so-called Chinese gable structure, the likes of which can be found in temples. There is a large public bath as well as a sand bath. It has become a symbol of Beppu, and a popular municipal hot spring where you can enjoy bathing from the early morning. Turning over a new leaf, our next destination was the Traditional Industry Hall where we headed to see Beppu’s traditional culture of “Bamboo Crafts”. Oita Prefecture’s bamboo production ranks first nationally. Everything from artistic crafts to kitchenware are handmade in Oita, using bamboo as the primary material. Even now, long-term loyal customers use those bamboo goods regularly. As Beppu’s popularity as an onsen destination spread in the Edo period, the area’s excellent bamboo kitchenware became widely favored as a souvenir. This is one reason the bamboo industry in Beppu was able to become so strong and advanced. A comprehensive exhibition panel and works of art are displayed, showing the relationship between humans and bamboo. Artworks using great technique are displayed as well as products for interior decoration. Tip! 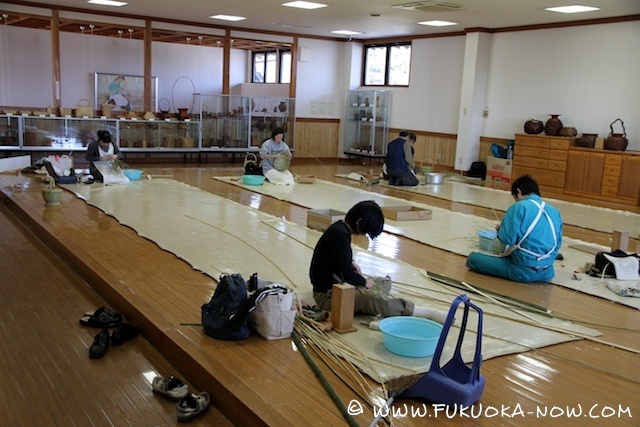 Book in advance to experience bamboo craft making for yourself (Japanese language only). 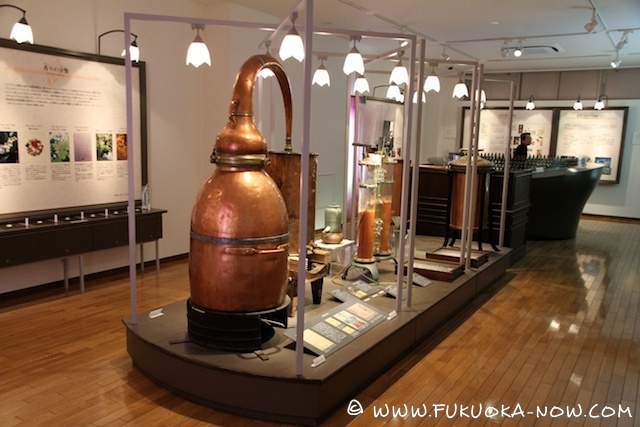 Don’t bother asking why there is a fragrance museum in Beppu, just be happy there is one! It was wonderful and one of the unexpected highlights of our trip. The beautiful, modern facility has a vast number of exhibits and fragrance related materials, and is operated by Beppu University. Try the perfumer’s workshop to experience the art of blending perfume. We tried it, and highly recommend it! 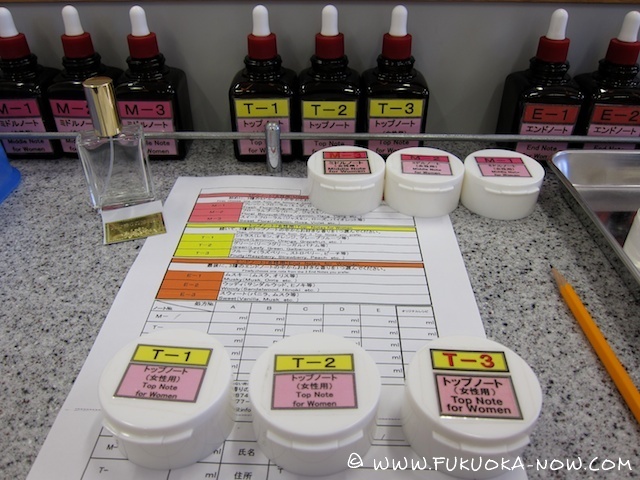 While learning the structure and features of fragrances, you can make the perfume of your choice. This is an experience that satisfies the intellectual curiosity of adults, and you get a special souvenir, which you can enjoy afterwards. Gentleman, this might be an ideal “date spot”. 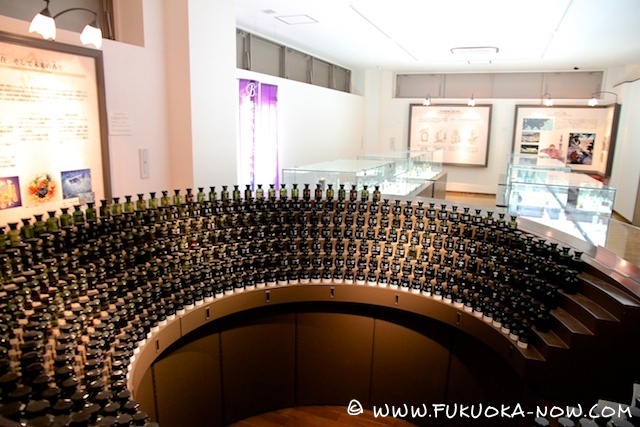 The museum has a huge number of perfumes. The history of fragrance and its relationship with people are on display along with the valuable collections of perfumes. Tip! If you don’t want to take part in perfume making, you can wait in the quiet aroma room next to the workshop and enjoy the scent of lavender. After the enjoyable workshop activity, we enjoyed a late lunch prepared by a traditional cooking method at the Jigokumushi (“steamed like hell”) Public Kitchen, located inside Kannawa Onsen. This cooking method was handed down from the Edo period. It is a very popular spot and becomes crowded especially at weekends, so we recommend going on a weekday instead! 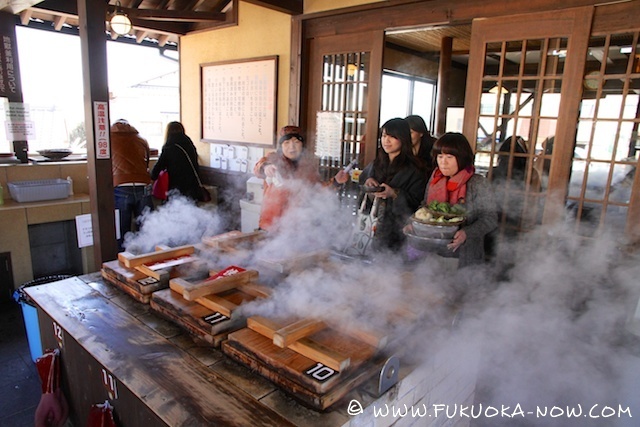 The Jigokumushi Method: Food is rapidly cooked with the Jigokumushi method, using hot spring steam that contains salt. This results in the goodness of the food being trapped inside, so you can enjoy the natural taste of the food without condiments. You are allowed to bring your own food items, however there are also shops around the area where you can buy vegetables, meat and seafood. Tip! Here are some approximate cooking times for various food items: 2-3 minutes for spinach, 10 minutes for eggs, 15-20 minutes for crabs and lobsters, 20-30 minutes for potatoes. 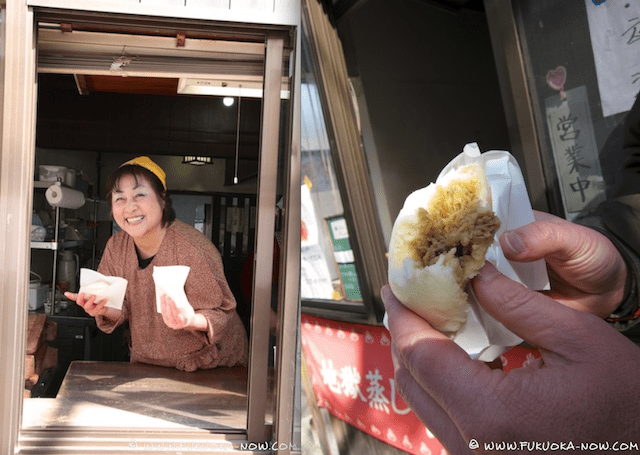 Later, while walking through the narrow streets, we snacked on another Kannawa specialty: handmade pork buns. 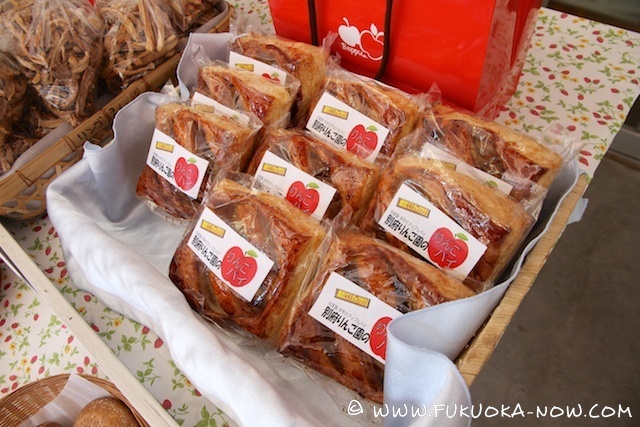 Then, for something sweet, we stumbled upon the Beppu Orchard apple pie shop. 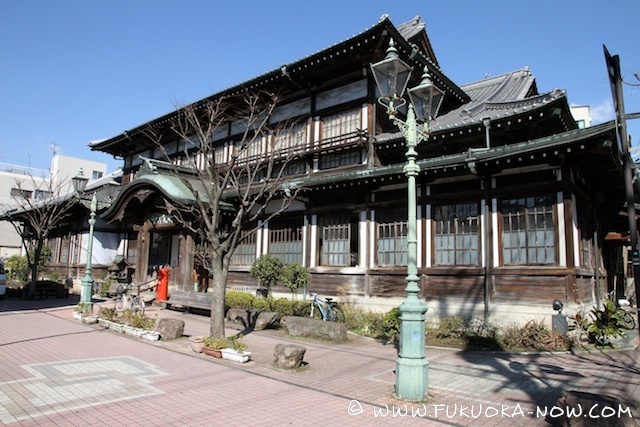 Kannawa Onsen is representative of the Beppu eight hot spring villages. Hot spring steam rises from many parts of the town, and a lot of public bathing places, inns, and souvenir shops are lined up in the streets. Try the famous “Steam Bath”, it’s like a sauna. 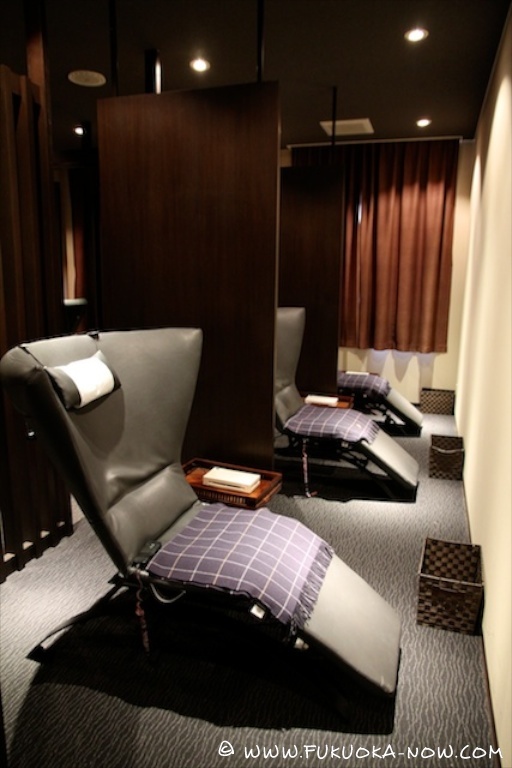 You can also dip your feet in a relaxing and unique Foot Steam Bath for free. 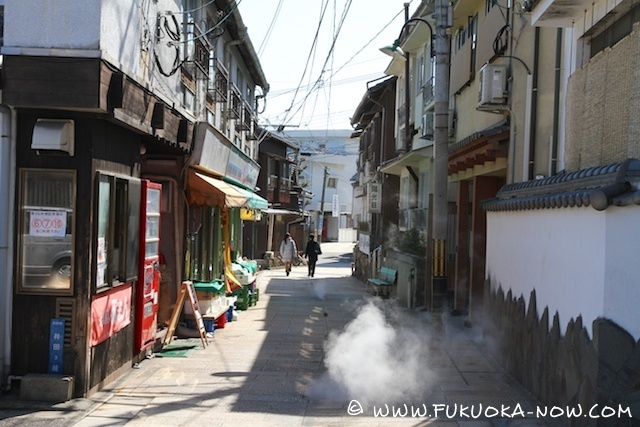 Steam rises from the streets in the Kannawa Onsen area. After a full day of culture and feasting, it was time to step back and see all we covered from a high vantage point. There’s no better place to do so than the summit of Mt. 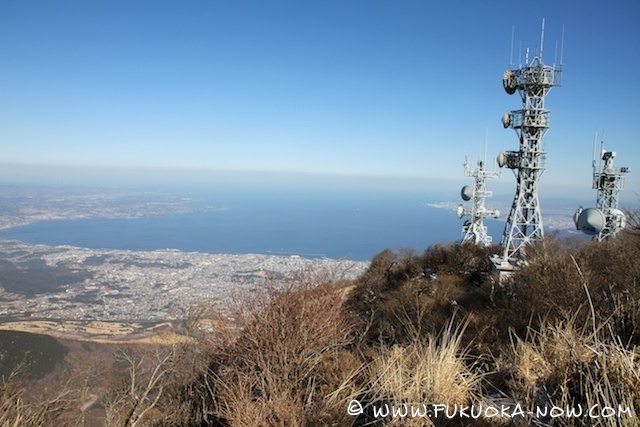 Tsurumi, the highest point in Beppu. While it is possible to hike up to the summit (1,375 meters) you’ll be happy to learn there is a speedy ropeway service. 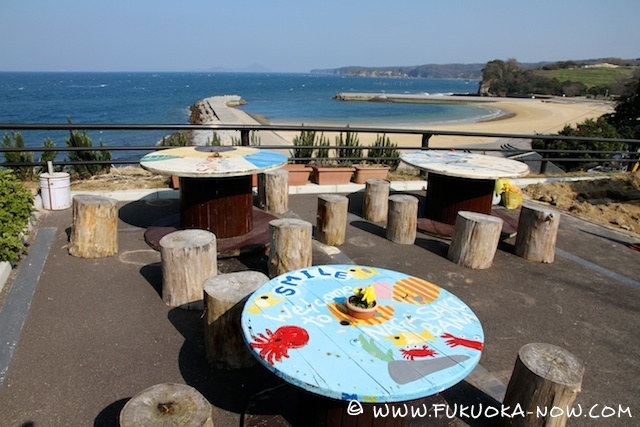 The views are fabulous – in the right weather you can see to Shikoku! 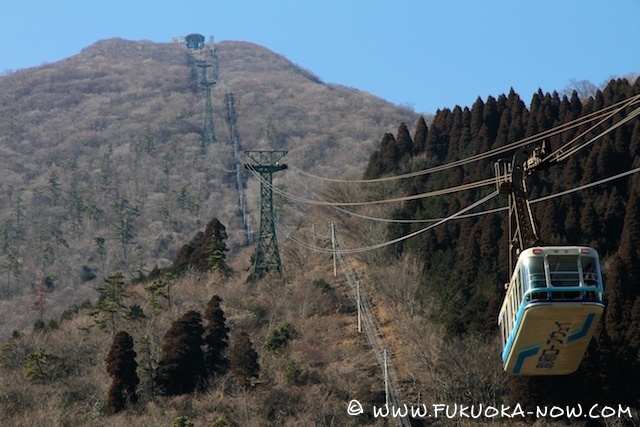 After getting off the ropeway there’s a park-like area with paths leading up to the actual summit. The view was a fitting finale to our trip, in which we saw and experienced so much. We are already looking forward to our next Oita Weekend Getaway. 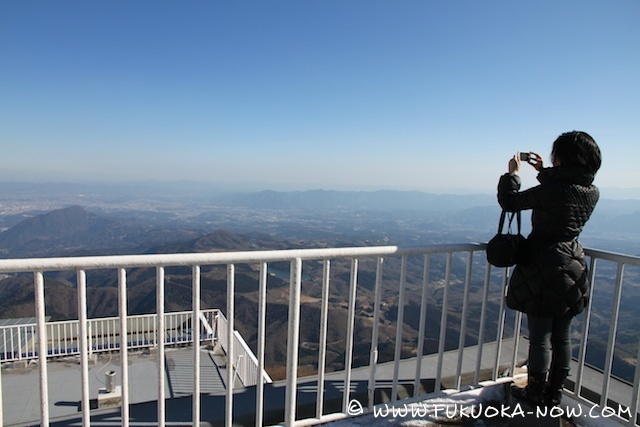 The Kuju Mountain Range, and as far as Shikoku Island and Chugoku District can be overlooked from the summit. 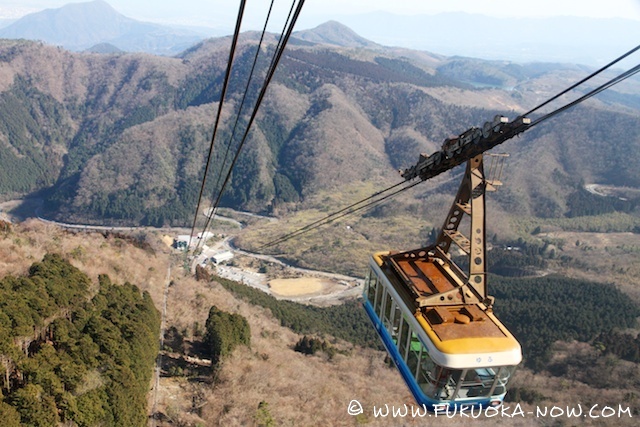 The ropeway is operated every 15~20 minutes. (Opening hours for the night view: The last departure: 20:30, Return: 21:00) The timetable for the ropeway’s night operation may change. Inquire in advance. 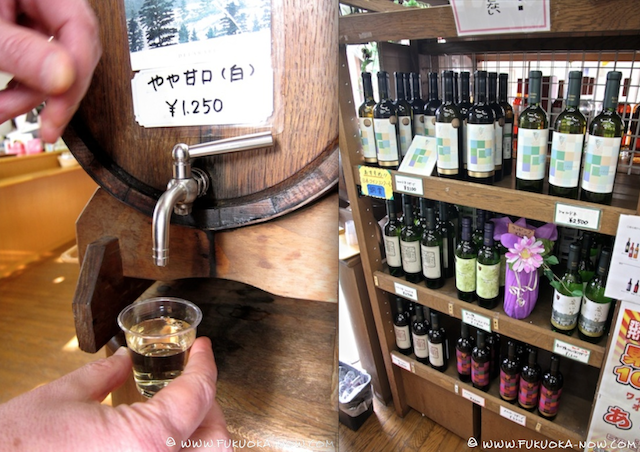 Located near the base of the ropeway (right next to the parking area) we found the Kyushu Shochu Center which boasts 300 kinds of shochu (distilled liquor) – with varieties from each prefecture in Kyushu for sale. Shochu Jelly is also available for ¥230 each (contains 3% alcohol). 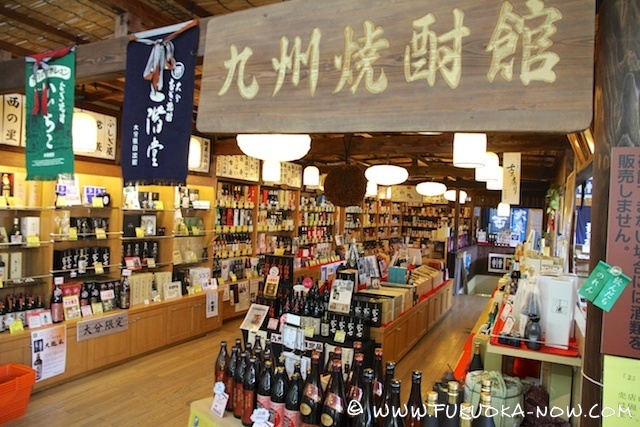 Remember – buy shochu as a souvenir, please don’t drink and drive. See you next time in Oita!